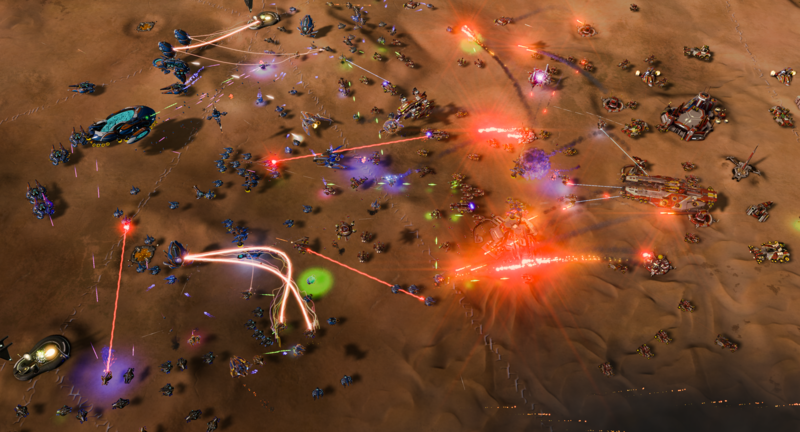 Ashes of the Singularity and Ashes of the Singularity: Escalation are being merged. 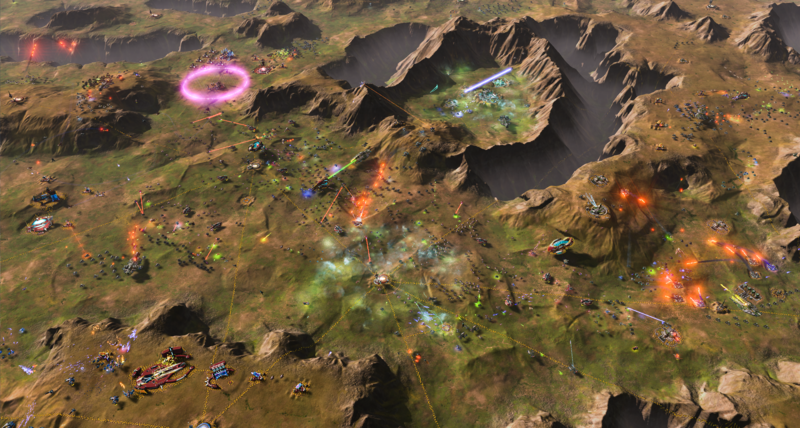 There will be only one game: Ashes of the Singularity: Escalation. Everyone who already has Ashes of the Singularity will also have Ashes of the Singularity: Escalation. Ashes of the Singularity is a massive-scale, real-time strategy game. It was also the very first DirectX 12 game and the very first game on any platform with a multi-core AI. Its technological innovation resulted in a lot of media coverage but the purpose was so that we could create a new type of RTS: One that could simulate tens of thousands of individual units. But as you can guess, that capability came with a price: The hardware requirements. 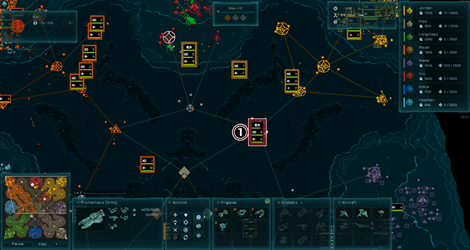 Because of the hardware requirements, our primary concern with the game's design was to appeal to the widest possible audience of strategy game player. We couldn't afford to alienate potential players by making the game too "hard-core". A lot more unit classes. And each time, we rejected these requests not because we disagreed with them (Stardock, after all, has strategic zoom in Galactic Civilizations, Sins of a Solar Empire, Fallen Enchantress, etc.). We rejected them because we were concerned that these features would make the game too "niche". Within a month of the release of Ashes of the Singularity, the game's sales were twice what we had expected. As exciting as that news was for us, it was also very concerning because it indicated that our projection model was completely off. Ashes of the Singularity required a CPU with 4 cores (most people only had 2) and a video card with 2GB of memory. 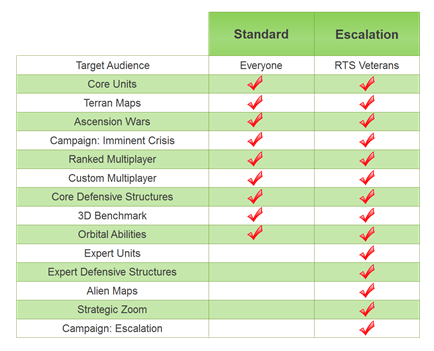 I want to contrast the hardware requirements with our other real-time strategy game: Sins of a Solar Empire: Rebellion. 1 CPU core, 256MB of video memory. In addition to selling a lot more than anticipated, the requests for the aforementioned 3 features became increasingly vigorous. At this point, we were still persuaded that the market for a hard-core RTS was not sufficient to add those features to the base game. Instead, we would create a stand-alone expansion pack for those players. In November, we released Ashes of the Singularity: Escalation to universally positive reviews. The lowest score it received was 75 and the user ratings as I write this are classified as "Very Positive". We also provided a $20 upgrade path for those who wanted to go get the expansion. However, many of our customers were not happy. First, many people who bought Ashes of the Singularity paid $49.99. Thus, even a $20 discount to get "the game they wanted in the first place" seemed unfair to them. Second, and more seriously, it split the community. 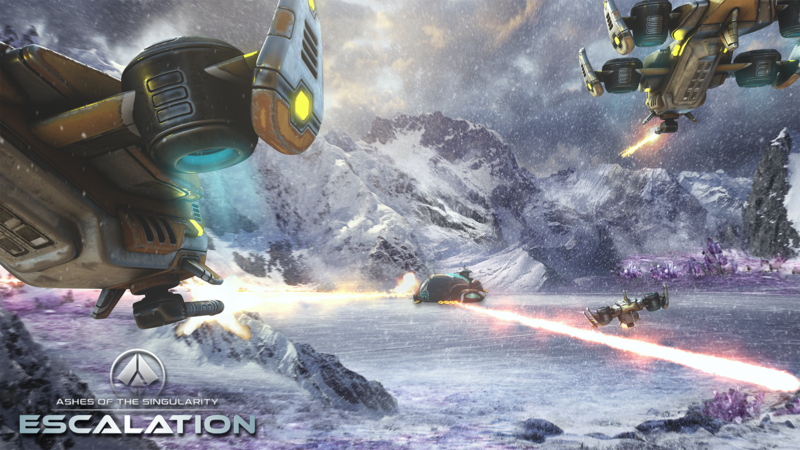 As many of you know, Stardock is one of the oldest independent game studios in the industry. I own it. And I try to interact directly with our customers through a variety of forums. As a result, we have the luxury of making decisions that may have some short-term pain but result in long-term success. The secret of Stardock's success is simple: We generally do whatever it takes to make our customers happy. Coming from the software side, having a standard and a Pro version of your product isn't a big deal. But in the gaming world, especially recently, it is a big problem and one that has proven impossible for us to bridge. For example, even if we solved the multiplayer community fragmentation, what about modding? What about community discussions on strategy and tactics? What about future expansions? Hence, I have decided to merge Ashes of the Singularity and Ashes of the Singularity: Escalation into a single product: Ashes of the Singularity: Escalation. We will update the game to have a "simplified rules" option for those who do preferred the more streamlined game mechanics and unit types (anyone who has ever tried to get a LAN party going with an RTS knows what I mean) but going forward, Escalation is the only version of the game. The base game will be discontinued. If you have a copy of it, you can still play it and we will still support it. But we won't be selling it anymore. Everyone who had Ashes of the Singularity now has Ashes of the Singularity: Escalation as well. And anyone who already upgraded to Escalation from Ashes now has an automatic season pass to the DLC for Escalation. By merging the products, we add over a hundred thousand people into the Escalation multiplayer pool, modding community, forums and allows us to focus all our attention on Escalation. If you have any questions, you can contact me directly on Twitter @draginol or on our forums at www.ashesofthesingularity.com. Q: Why didn't you just have the features in Escalation in the base game? A: Because at the time of release, 40% or so of the Steam user base couldn't even run the base game. Anything that made the game more of a "niche" seemed to be risky. Q: Why do you think Ashes sold so much better than you expected? A: Most of our demographic data comes from Sins of a Solar Empire and Galactic Civilizations and those indicate most strategy game players tend to have more modest PC setups. However, power gamers, for lack of a better term, tend to have higher end PCs than expected and Ashes appeals to power gamers more so than our other titles. Q: What made you decide Escalation was the future and not the base game? A: The player stats. Despite having a much smaller base (it just came out recently) Escalation has more people playing it. From a long-term point of view, an engaged user base is critical. Q: You spoke about modding, what is your modding goal with Ashes? A: Ashes of the Singularity was the first game to utilize Oxide's new, state-of-the-art engine, Nitrous. It was the first DirectX 12 game and soon will be the first game to support both Vulkan and DirectX 12 simultaneously. Thus, in many respects, Ashes was designed to be a platform. Our goal is for someone to be able to mod Ashes into virtually any type of game. Q: What is the next expansion pack going to focus on? Q: When will we see Escalation in our Steam account? A: Now. It has been automatically added to your account. Q: If I purchased from Stardock (not Steam), do I need to get a new Steam Key from my account? A: No, you do not need a new key. The upgrade will be done through Steam automatically. Q: What types of DLC are you working on? A: We're working on Episode 3 which is a new campaign along with new maps, scenarios and game modes. Q: What updates are in the works? 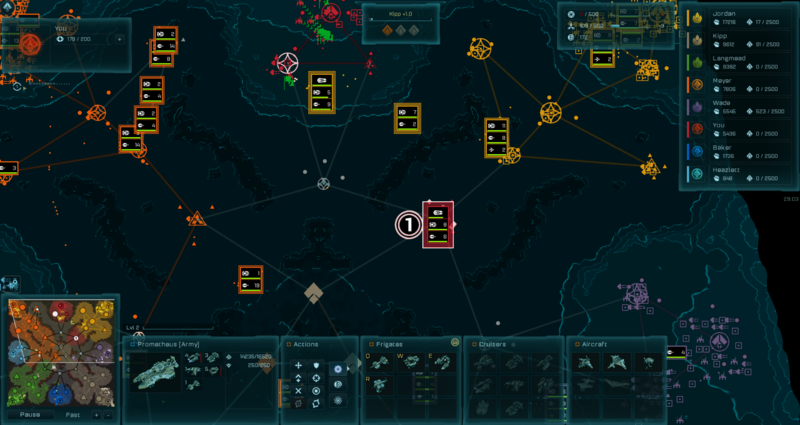 A: We have replays almost ready, a new class of units: Juggernauts (similar to Titans from Sins of a Solar Empire), a mod manager, more single player AI updates, mass-multiplayer performance and stability improvements, and much more. Q: What types of changes can we expect in the future of this game? A: Lots of new types of units including organics, the aforementioned naval units, tracked, walking, more flying units, etc. Q: Right now, the units hover, why is that? Q: With the merging of Escalation, who is the target market? A: People who are familiar with real-time strategy games. We do plan to provide simplified rule options for newcomers (useful for LAN parties and such).